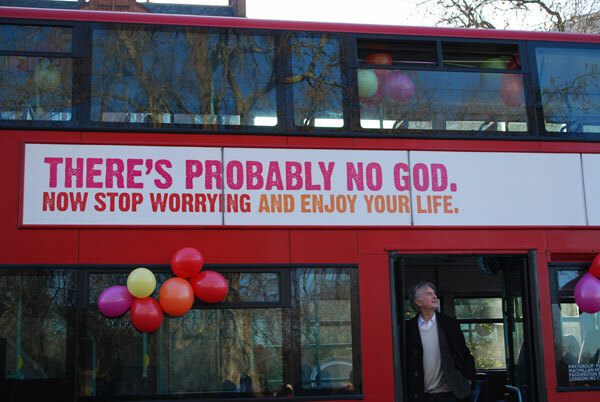 Er...Sir Dawkins, the bus seems to be a wee bit empty. One of the last things i did in 2009 was to watch CNN. It happened that I stumbled upon the programme World Connect (or is it connect world) with Becky Anderson and among the connectors of the day (or is it year now) along with Taylor Swift (whom i am a big fan of, for the record) was Sir Richard Dawkins: Darwin’s Rottweiler. Richard Dawkins is best known along with his materialistic evolutionary stance for his militant atheism and his best known work of recent, The God Delusion (title speaks for itself) has been much talked about as an example of the recent angry atheist publications. He just barked wrote a new book called the Greatest Show on Earth where he gives, for a change evidence for Darwinian evolution. I have not read the book though but anyone familiar with Dawkins will know what to expect. If there is a God, then he will be much more intelligent than all the gods in the worlds religions. So it seems Dawkins’ problem is not that believers in God are just plain deluded but that they are so deluded (or not deluded enough) to believe in a god with a higher IQ. This statement and similar statements commonly barked out by Dawkins is so presumptuous and vain that is difficult, for the sheer ignorance of the statement, to find where to begin to refute it. For the Christian or anyone who is conversant with the rudiments of Christian Philosophy (especially that of St. Thomas ) the statement becomes even more inexcusable as it is incomprehensible. God in the Christian (Catholic faith) is Infinite intelligence (from mathematics we have an idea of what that word infinite implies). Being Being in the fullest sense God possesses perfectly, as the source, all the perfections of all other created beings including the perfection of intelligence (St. Thomas’ Fourth Way). The infinity of God can be appreciated even more profoundly when we consider that God cannot be known completely by any created being as being is, in the last analysis, the object of the intellect and the more perfect a being is the more knowable it is in it self. Therefore God, who is infinite being is infinitely knowable in himself. He is therefore also infinitely unknowable as only an infinite intelligence is capable of having infinite being as its object. Only God can know him self completely. From this apparent truism a whole world of truth can be drawn among which is God’s infinite intelligence which by far surpasses anything we can imagine with our finite minds. and is with him for ever. A similar thing can be said about Islam which also stresses the transcendence and infinity of God. It may help to note that St. Thomas also made use of the philosophical truths attained by the Muslim philosophers Avicenna and Averroes in ways of knowing God through created things. Dawkins has not actually bothered to even know what the deluded mass of humanity says about God. In any case I can’t imagine what kind of God Dawkins will propose as more intelligent than that of the world’s religions. Maybe the God of Bruce Almighty or Nespresso loving God of the George Clooney advert or maybe the pantheistic everything-is-god-is-everything of Avatar. Or maybe on the positive side the Greatest show on earth has finally given Dawkins a glimpse of the organizer and these statements may just be a proud reaction to a realization of what some have suspected and many have known with a certainty that science can never give. There maybe hope for the possible taming of the Rottweiler. Time will tell. Yes I admit that I haven’t read any of Dawkins’ books. By ‘ for a change’ I meant not just writing about evolution but his trying to lay out, as clearly as possible, the evidence for the truth of special evolution,not merely dismissing objections (especially those of the ID movement) to Darwinian Evolution.